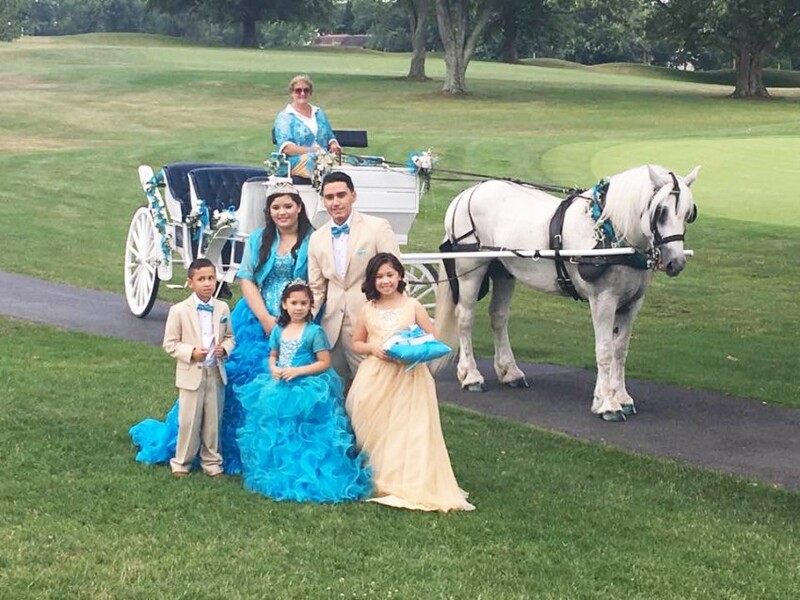 We provide gorgeous white horses and three beautiful horse carriages for weddings, anniversaries, proms, Quinceaneras and other special occasions. We always decorate our horses and carriages in beautiful ribbons and flowers to match each event, free of charge! We serve the MD/VA/WV/DE/PA/NJ areas. This was definitely a winner these people attend to every little detail down to the horses feet where they painted them to match our theme. The horse was beautiful and all the personnel went out of there way to doing everything they could to make our day great. I would definitely use them once again. Sterling - Thank you so much for your kind words! It was our pleasure to see you and Deborah get married! You were wonderful clients . . . it was a beautiful evening! We wish you many years of wedded bliss! One of my best times in my life!! Thank you for everything!! Will recommend all for this!!! Thank you so much, Pratap, for the great review! It was wonderful for us to see how happy you were during your vidai ride with your lovely bride. It makes us happy to see our clients happy! May you enjoy many decades of wedded bliss! Price Range: Will price match anyone! 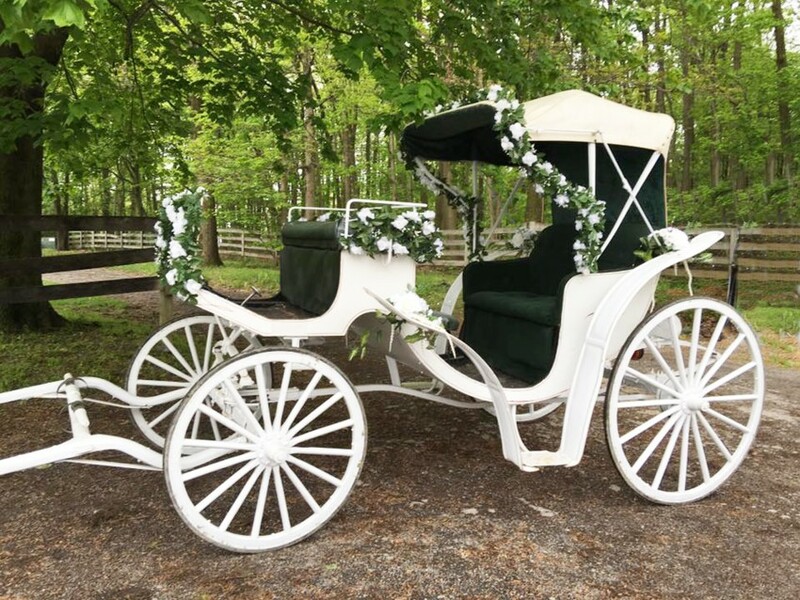 We have beautiful snow white carriage horses and three beautiful carriages that are perfect for weddings, anniversaries, Quinceaneras and other special celebrations: a gorgeous, custom built *one-of-a-kind* Golden Carriage that seats eight, a very romantic white two-passenger Victoria Carriage, and a white Limousine Carriage that holds six adults. Our horses and carriages are always decorated in ribbons and flowers to match the colors of the day - at no charge. We service the Maryland, Virginia, West Virginia, Pennsylvania, Delaware and New Jersey areas. Our drivers and attendants are dressed in formal black attire, but we can change that up to fit in perfectly with your day's theme, if so desired. 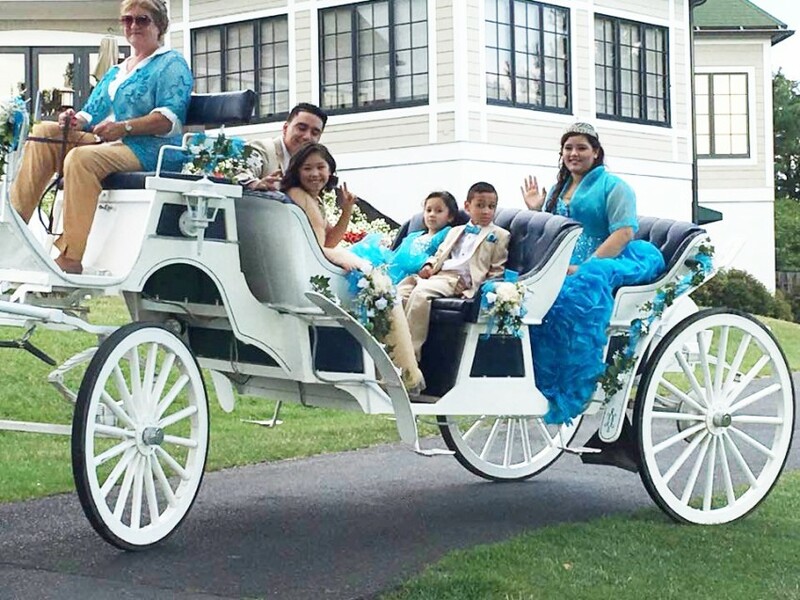 For weddings, we usually offer an "Entrance Ride", whereby the bride arrives in the carriage at the ceremony site with whomever she'd like to accompany her, then we wait while the ceremony takes place. After the ceremony, we'll whisk the happy couple away in the "Goodbye Ride", which allows them to breathe and relax for a few minutes while their guests advance to the reception site. We then return to the venue and stand for photos with the wedding party and family. All of this usually takes less than two hours, which is our normal time limit. More time can be arranged, if necessary. We usually don't act as transportation down highways or distances over 1/2 mile. The horses travel pretty slowly, and we like to keep them safe from dangerous traffic situations, for everyone's sake. We recommend staying in the general area of the main event, whereby we can provide all the great photo ops the family wants, without anyone going through any unnecessary stress. In cases where the ceremony and reception are far apart, we are happy to pick the bride up somewhere close by the reception location, to allow her first reveal to family and friends to be grand, but safe. Our horses are very loving and kind and will lower their heads to interact with little children - a favorite moment for photographers! 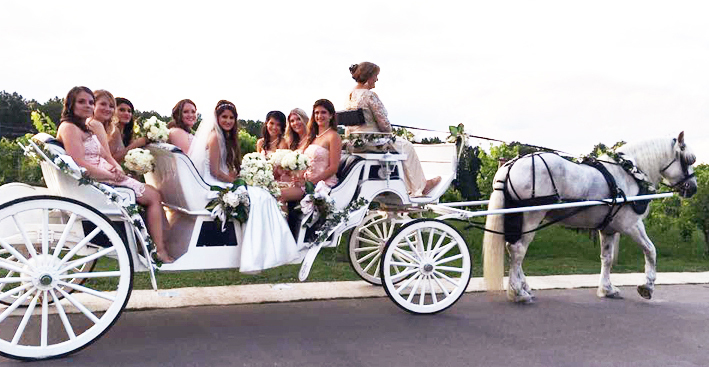 All in all, our horses and carriages will make any special day even more fabulous and memorable, for everyone! Spring Fever Farm, the home of Diana's Wedding Horses, is famous for it's beautiful white horses - Andalusians, the gorgeous horses from Spain. We've been located in Central Maryland for over 26 years and have participated with our decorated horses in weddings for the past ten years. In September of 2014, we had the honor of providing the two white horses for Taylor Swift's music video, "Blank Space". 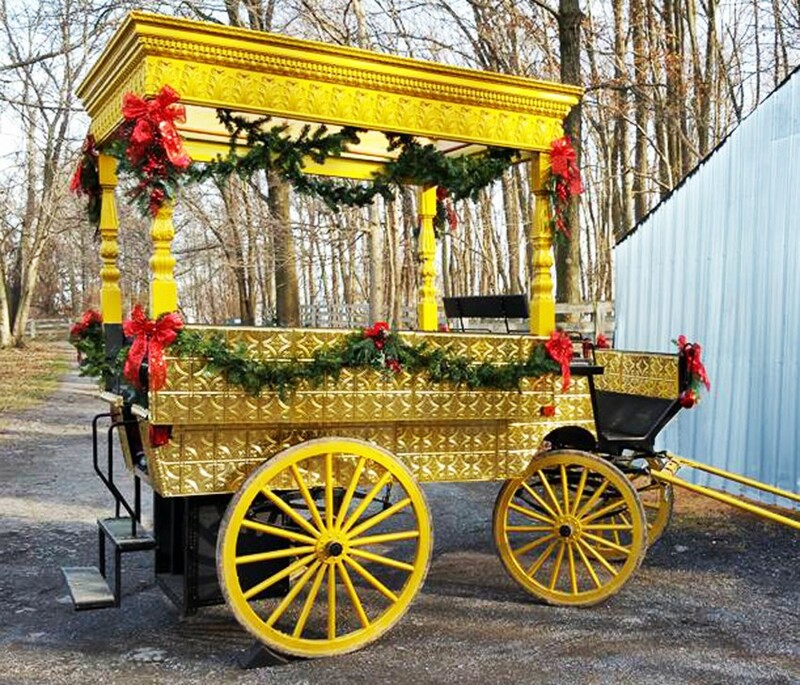 In the Spring of 2015, we completed production on our gorgeous Golden Carriage - a one-of-a-kind carriage custom designed and built by us for Quinceaneras, weddings, proms and other special occasions. We also have a beautiful white Limousine Carriage, which is extra long, and a romantic two-passenger Victoria Carriage, in order to give our customers more options in planning their celebrations. Today, we are one of the very best carriages companies in the area, and take pride in decorating our horses and carriages with beautiful ribbons and flowers in the colors of each event - all at no charge! Making our clients over-the-moon happy with our horses and carriages is our ultimate goal!